As I shared yesterday, we are in the midst of working on transforming our kitchen into something that is a little more our style and part of that style is incorporating creative little touches. After looking at our budget, we decided that replacing all of our appliances with new ones just didn't matter that much to us. The only appliance that needs to be replaced is our stove, the dishwasher and fridge are GREAT- no they are not top of the line stainless steel but they work just fine. The dishwasher is dated so I decided to use my love of drawing pattern to transform a dishwasher from the 80's into a fun piece of art! While I could have drawn directly onto the surface of the dishwasher I decided to go with something a little less permanent (I tend to change things so I wanted to be able to take my drawing off and make a new one someday!) so I used white contact paper. I cut the contact paper to size (I covered all the areas except the panel of buttons). The next step I gave lots of thought and planning- while I could have doodled on the paper before sticking it to the dishwasher, after some experimentation, it was pretty challenging so I decided to go ahead and stick the blank paper to the dishwasher and then draw. Then I went to town doodling! I work pretty fast on creative projects but this one wasTIME CONSUMING- it took me an entire day (about 9+ hours) which for me is a long time. It was hard on my black and my hand but the end result is SO cool! In one day and for about $10.00 our dated dishwasher was transformed into a really cool and unique statement piece in the kitchen! So much better than stainless steel (in my opinion). For those who will ask- yes, we have run the dishwasher a couple of time and the contact paper is holding up just fine! 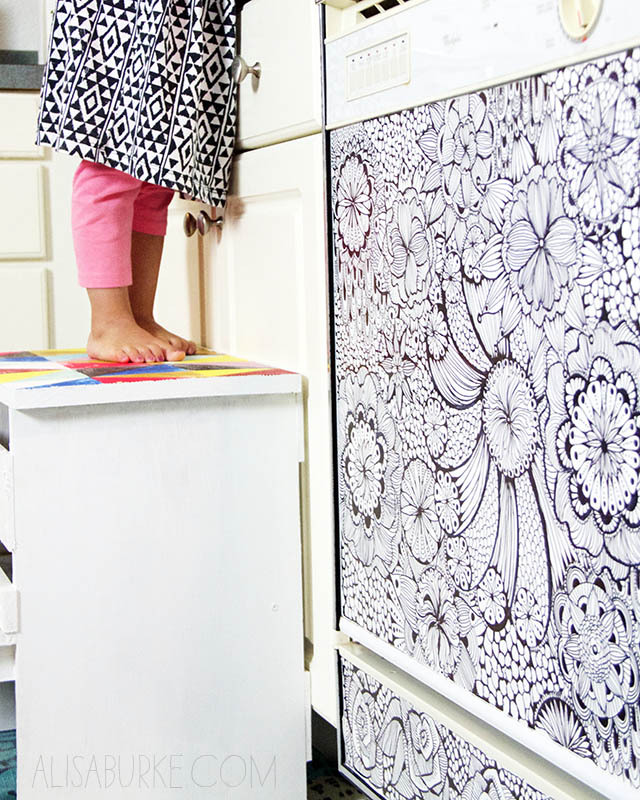 What a great idea to refresh the kitchen furniture. Dear Alisa, congratulations for your creativity! Such a great idea! And You have personalized dishwasher! Beautiful! Grande idea ed ottimo risultato!... belle anche le rose del bordo sotto, la ADORO!!!!! Great idea and great result! ... Even beautiful roses border below, I LOVE it!! Thank you for sharing your work! I have loved all your art projects and this one is definitely one to make me think outside the box. I love how you work around your daughter which shows patience and diligence and the importance you put into incorporating her into your loves. Lucy is so blessed. 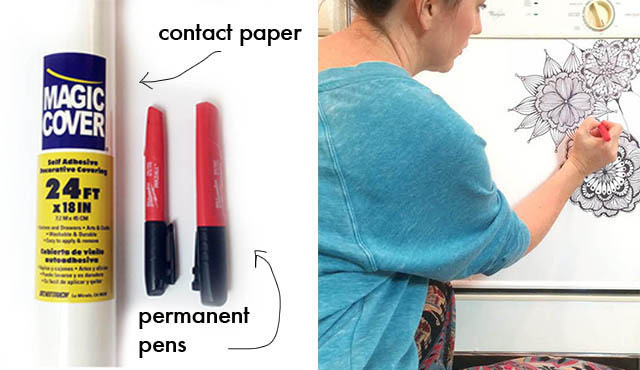 Super idea to use the contact paper! Can you explain what made it challenging to doodle on the paper before hand? I would think that would be easier so am really curious add to what happened. What a wonderful project. 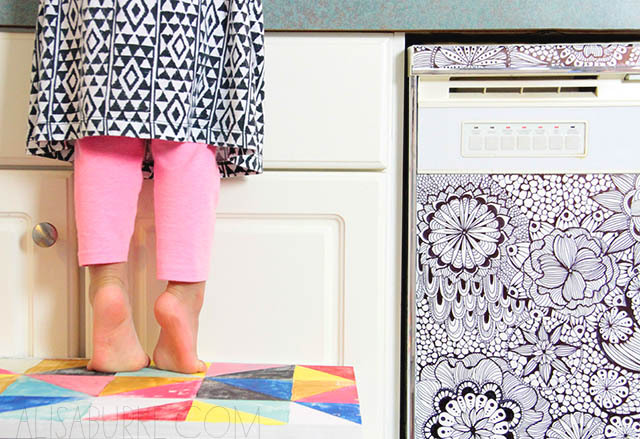 And it really makes one consider just how versatile this contact paper idea could be when it comes to customizing/beautifying other mundane objects! It looks awesome! The door of our dishwasher doesn't get hot at all so I think the contact paper will hold up very well. I can see where some who have stainless steel already will be wanting to try this... Nice job! Love this - how fabulous to use this area for your art. SO, so worth it! 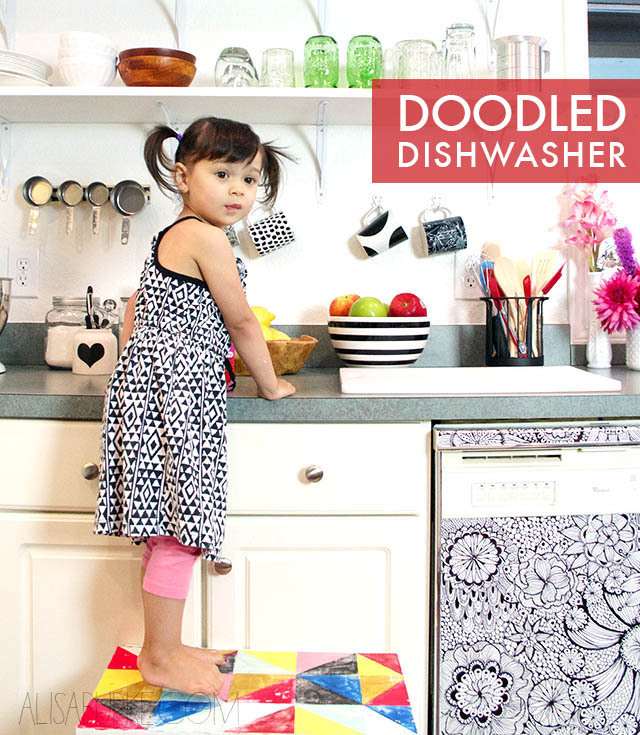 Ten times better than any other dishwasher I've ever seen. I'm off to do my shower curtain since I don't have a dishwasher. Next, maybe a valance somewhere. You have GREAT ideas. Love this so much...I am such a bad doodler, you are so inspiring! I noticed it in an earlier post and thought it was wonderful. The funny thing is, we are doing a remodel and I am painting an appliance and adding moldings. Fun.. 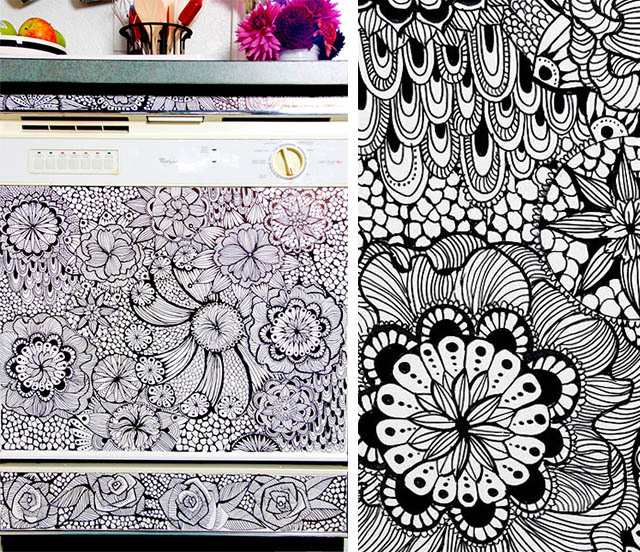 I Hate Stainless Steel...and my fridge I am going to paint is just that...Anyway...yours looks FAB! This gives me sooooo many ideas! Lucy is growing fast and so cute I just wanna squeeze her!! Love this! Reminds me of years ago when our old fridge still worked but looked awful. I decided to cover it with wall paper which (at the time) matched the rest of the room. It came out perfectly and used it until we moved 10 years later. What a gorgeous project! Love how the dishwasher turned out!!! I kinda wish I didn't buy a new dishwasher now! Great job!